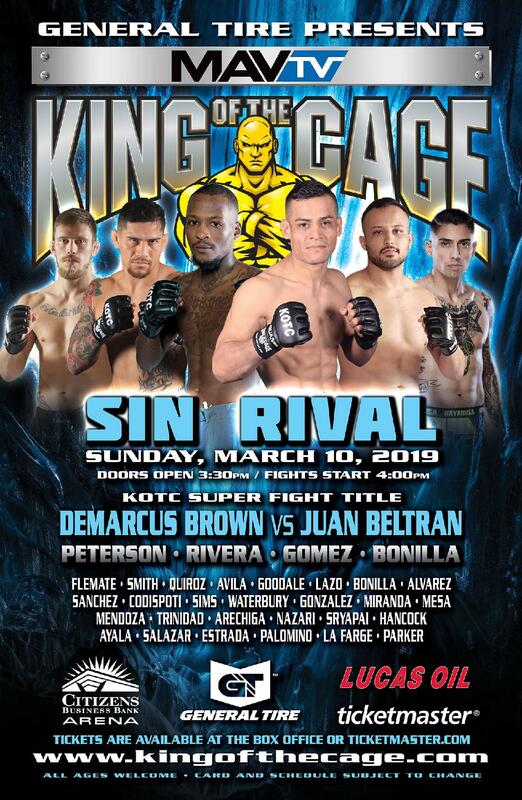 King of the Cage returns to Citizens Business Bank Arena in Ontario, California on Sunday, March 10, 2019 with a nationally broadcast event headlined by Flyweight World Title showdown between current KOTC champion Tony Gravely vs. undefeated Johnny Munoz. The co-main events will feature a Lightweight showdown between Jason Cordero vs. Fernando Padilla and Albert Veloz vs. Mauricio Diaz in a bantamweight bout. Current Champion Tony Gravely (16-5), Radford, Virginia (Tech MMA & Fitness Academy) vs. Johnny “Kid Kvenbo” Munoz (8-0), Norco, California (C-Quence MMA). Gravely won the title in his last bout and is top ranked in the division. Munoz has never lost in both his professional and amateur career and six of his eight pro fights have been won is the first round. Juan “Sin Miedo” Beltran (6-0), East Los Angeles, California (The Mini Gym/TKJJ) vs. Demarcus “Bang ‘Em Up” Brown, Huntington Beach, California (Ultimate Training Center). Both are fighting for the vacant Bantamweight Title. Beltran is top ranked and one of the top upcoming stars in MMA. Brown has six professional wins and has won his last two of three bouts with first round knockouts. Jonathan Rivera (7-3), Fountain Valley, California (Classic Fight Team) vs. Jeffrey “The Administrator” Peterson (10-5), San Diego, California (Alliance MMA). Rivera is top ranked and coming off an impressive first round victory. Peterson has won his last seven of eight fights. David Gomez, Rancho Cucamonga, California (Body Shop) vs. Matt “Berzerk” Lagler, San Diego, California (San Diego Combat Academy). Gomez has seventeen wins in his professional career and is top ranked. Lagler is a veteran fighter who has 12 wins and has tremendous knockout power. Doors open at 3:00 pm. and fights start at 4:00 pm. Reserved Seating and Ringside tickets are on sale now. For more information or to purchase tickets, please visit Ticketmaster.com. All ages. Event card subject to change.